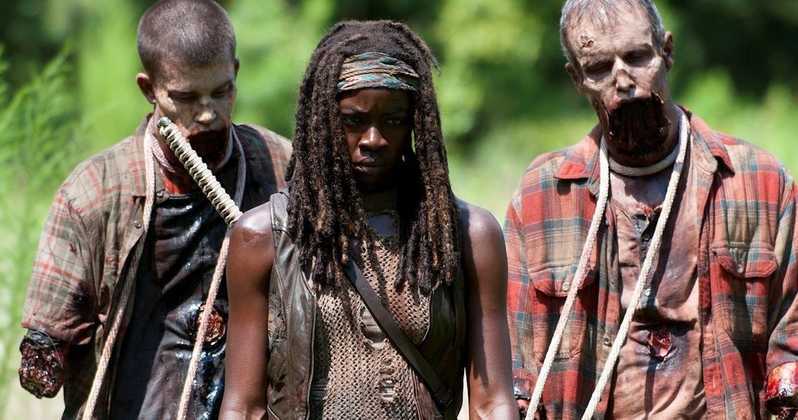 When Danai Gurira joined The Walking Dead with season 3 as popular katana-wielding Michonne, it was the kick in the pants the series needed after a lukewarm second season. Her career has really taken off since then, and honestly I'm surprised she's lasted as long as she has, but now that time is up. THR reports Gurira will make season 10 her last on The Walking Dead. The Black Panther star, activist, and playwright will only appear in a handful of episodes in season 10, but that may not be the last we see of Michonne. With three Walking Dead movies in the works it's likely she'll turn up there...assuming she doesn't get written out in a final way. It's doubtful AMC will pass up the opportunity to reunite Michonne with Andrew Lincoln's Rick Grimes, though. This is another big loss of a fan-favorite character for The Walking Dead fans, but the show soldiers on. After the losses of Lincoln, Lauren Cohan, Chandler Riggs, and Steven Yeun, we'll have to wait and see if this is the one that causes a major exodus of viewership.